The Turkish army’s first ever domestic Main Battle Tank (MBT), Altay, is ready to start mass production today—in real life and online. Prefer your warfare to be a little last century? You can check out our best World War II games for PC list then. 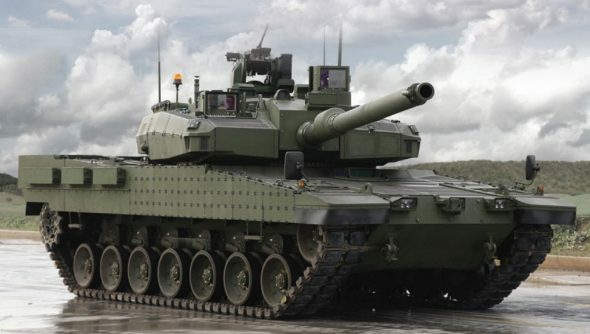 The tank, designed by Turkish civil industry firm Otokar, has been declared by company chairmanAli Koç as ready to be built if the government will assign the contract to them. Altay, which will be the first MBT developed by Turkey since a short run in World War II, is set to enter the field in 2018. However North American developer Obsidian Entertainment has already begun work on introducing the tank to their warfare simulator Armored Warfare. The 120mm L/55 smoothbore-wielding tank is set to arrive in the game by 2017, with characteristics and tier ratings not yet decided on. The real life version can reach up to 70km/h and is developed on the South Korean K2 Black Panther design, which is also set to be added to the game in the near future. So if you were thinking about picking up a 65-tonne, 1,800-horsepower main battle tank fresh off the production line in two years time, check it out in-game to see if it’s what you’re after for a run down the shops?